How everyone should be able to and now can enjoy the benefits of wholesale. What if wholesalers were crossing over to sell directly to consumers at that lower price, becoming in effect retailers, but passing along the wholesale benefits to consumers? Well, thanks in large part to the Internet and ecommerce, it's happening today. And consumers are the beneficiaries of this boundary blurring. From the folks at Brightpearl, here are brief definitions of and the chief differences between wholesalers and retailers . 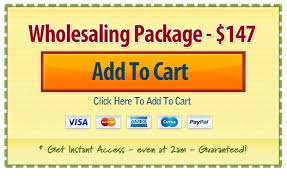 . .
"A wholesaler is a person or company who sells products in bulk to various outlets or retailers for onward sale. Wholesalers are able to sell their products for a lower unit price as they are selling in bulk, which reduces the handling time and costs involved." "A retailer is a person or a company who sell products directly to their customer for a profit. The retailer may be the manufacturer of the product, or may acquire relevant products from a distributor or a wholesaler." Pretty simple really: the wholesaler sells lots of a product at a lower price owing to the huge volume, and then the retailer, often buying from a wholesaler, sells fewer of the product directly to consumers at a higher price to make up for the lower volume. But what if these distinctions were blurred and boundaries smudged? What if wholesalers were crossing over to sell directly to consumers at that lower price, becoming in effect retailers, but passing along the wholesale benefits to consumers? Well, thanks in large part to the Internet and ecommerce, it's happening today. And consumers are the beneficiaries of this boundary blurring. But first let's take a quick peek at the history of wholesaling . . .
Wholesaling, as we mentioned, involves selling merchandise/products to consumers other than the end retail customer. In the typical traditional model, the products and merchandise were sold to another wholesaler further along the chain, to a retailer, or to a business that would use the products in the course of running the business. Basically, the wholesaler stood between the producer and the end user. And, most of the time, wholesaling involved quantity or bulk sales at a price generally much lower than the retail price. Wholesaling came into its own after the industrial revolution was in full swing, especially in the eighteenth century, which saw the advent of full-blown mass production, as well as the development of effective mass marketing techniques. This confluence of mass production and mass marketing made wholesaling especially advantageous around the middle to latter part of that century. Mass production was simply the result of manufacturing's refining and application of the principles and techniques of specialization, division of labor, and standardization of parts. These principles, effectively applied, allowed manufacturing processes to achieve high output rates at a low unit cost, with the costs usually decreasing in proportion to the in increase in volume of output. The two main principles in mass production are division of labor, which creates the conditions for specialization, and the use of tools and machinery in such a way that processes could be standardized and automated and parts could become interchangeable. The result? Lots of quality goods quickly and efficiently produced at relatively low cost. Think Henry Ford and the production of his Model T.
But all those quickly produced, low-cost goods still had to be marketed somehow – target consumers still had to know about them. So in the second half of the eighteenth century modern mass marketing was born. "By the 1880s," according to AdAge, "a number of marketers achieved unprecedented economies of scale, expanded their distribution and reached for coast-to-coast markets, Mail-order selling [the precursor of today's ecommerce] flourished with the development of the national railroad system and the introduction in 1896 of rural free mail delivery." In addition, businesses soon "began to recognize that advertising could not only reduce production costs by increasing sales but also create desires in consumers." As a result, "national advertising of mass-produced, brand-name packaged goods emerged as one of the most significant developments of the post-Civil War era>"
Hence, the flourishing of wholesaling – and the burgeoning need for copywriters, ad agencies, and marketing specialists. Chicago has long been called America's Second City. The reason isn't entirely clear, but here are the two most convincing theories. The first is that the current Chicago is the second Chicago because it rose Phoenix-like from the Great Fire of 1871. The other theory is that Chicago acquired this appellation because it has always been second to New York City in population. But when it comes to wholesaling, Chicago just may hold the number-one spot. Since the mid-nineteenth century, Chicago has been a major wholesaling center. In fact, Chicago's wholesalers have long been among the nation's leading distributors of such vital goods as grain, lumber, dry goods, metals, and hardware. And, despite the decline of wholesalers as the critical middlemen in some industries, Chicago remains today a wholesaling capital. The wholesaling trade in Chicago received its greatest impetus in 1848 when the Illinois & Michigan Canal was completed. Then it got a further boost on the completion of major railroad links to the city in the 1850s. Just before the Civil War, Chicago's annual wholesale trade was estimated to be around $32 million. By that time, Chicago had become one of the leading North American centers for the distribution and marketing of grain. With grain wholesaling so prominent, Chicago was becoming one of the most important sites world-wide for the marketing of corn and wheat, with the Chicago Board of Trade serving as regulator and promoter of the wholesale grain trade. In addition, leading lumber merchants like Charles Mears amassed fortunes serving as wholesalers for lumber products. From the late nineteenth into the early twentieth century, Chicago's wholesaling firms and their total volume of business continued to grow. The city also remained the home of the leading wholesalers in groceries, hardware, paper, and metals. After an understandable decline during the Great Depression, Chicago's wholesaling had rebounded by the 1950s to include 175,000 residents employed by about 11,000 area wholesaling firms, with a total annual sales around $20 billion. Buy the last decade of the last century, the Chicago-area's annual wholesale trade amounted to roughly $190 billion. The Chicago metropolitan area at that time boasted 18,000 wholesaling firms employing 260,000 people. So Chicago has been and is a lot more than "Hog Butcher for the World," as Carl Sandburg put it, and wholesaling has been a lot bigger than many of us realize. everyone involved – from the manufacturers on one end to retail customers on the other end. Without the wholesale entities, manufacturers would have been forced to market their goods directly to a huge number of retailers and/or to an even greater number of consumers. And it would have been at higher unit costs. On the other hand, retailers and/or the end consumers would have had to seek out and deal directly with many manufacturers, at both high cost and considerable inconvenience. Because the business of wholesaling generally involves buying in large quantities and then delivering those quantity-purchased goods to customers in smaller quantities, wholesalers are thus able to perform physical distribution functions far more effectively. These functions include materials handling, inventory management, and warehousing. Their capabilities for quick, frequent, and as-needed pickup and delivery allow both producers and customers to skirt the risks involved in holding large inventories. Wholesalers can also provide market-planning assistance to retailers with respect to pricing and promotion. Wholesalers become, in effect, an extension of retailers' workforce because they enter into sales contracts with producers and can sell different quantities of products to retailers. One of the most valuable services wholesalers can provide to producers is keeping them apprised of market conditions. Producers striving for market development and looking into growth strategies often rely on their wholesalers' assessment/analysis of market conditions. Obviously, wholesalers have a marketing position that puts them into much closer contact with the end retail customers than the producers. And wholesalers are usually able to spread their sales cost over a wider spectrum of products than producers can, with the result being lower costs per product for wholesalers. Owing to this, many producers hand over some of their financing and distribution activities to wholesalers. In addition, wholesalers often become an important ingredient in retail distribution strategies because they have their finger on the market pulse and are skilled in negotiating final purchases. The upshot of all this is that wholesaling is critical for the success of both producers and retailers. And this is especially true now in our digital age . . . when traditional distinctions are disappearing. But today – owing in large part to the Internet, but also changing consumer expectations – things are in flux. First, the sharp distinction between the services provided by wholesalers and those provided by other businesses (like retailer) is changing and becoming less distinct. Retailers, for example, have started figuring out that they can deal directly with producers and can likely perform some of wholesalers' functions themselves. With the speed of computers and the ease of online commerce, retailers are now able themselves to expeditiously and effectively order, handle, and deliver goods. What this means, then, is that ecommerce – the selling and buying of goods and merchandise online – is becoming the new wholesaling. Here's some evidence . . . Consider Alibaba – a big player in ecommerce certainly, but are they wholesalers or retailers? It's hard to tell, really. In 2014, only 11.8% of their revenue came from wholesale, but keep in mind that that worked out to one billion dollars. Then there's IKEA. They aren't really a wholesaler, but their fairly recent change in strategy to a focus on ecommerce makes them look a lot like one now. Ecommerce isn't just for the big retailers and wholesalers changing their identities. For example, Etsy, the venue for a multitude of independent retailers, has now fully embraced ecommerce as a way for its independent retailers to fill wholesale demand for products. Ecommerce is cost-effective because startup costs are relatively minimal – no physical store, no fleet of sales staff, and no huge inventory of products to warehouse. Basically, the only costs are inventory management software and/or an ecommerce platform and some marketing expenses, whether retail or wholesale or a blended model. And the opportunities for increasing business efficiencies are impressive. According to TradeGecko, "Online catalogs and websites with customized pricing and tailored storefronts give customers the personalized experience they're seeking." As many in the industry remind us daily, the experience is the product. So now the ease and immediacy of ecommerce help provide that customer experience that is just as important as the product itself, which is another blurring of the boundary between wholesale and retail. At Wholesale For Everyone, we believe, as our name says, that everyone should be able to enjoy the benefits of wholesale. You shouldn't have to be a retailer or have to buy 300 bandanas or 453 T-shirts to get that speedy delivery and low price. We have only one goal. And that is to offer a large portfolio of quality products at affordable prices. We even offer discounts on single pieces. Wholesale for Everyone really is for everyone. Everyone who wants to buy quality products and save money. Because the more you buy, the more you save. And who doesn't want more bandanas, caps, and T-shirts? Certainly, buying in bulk means significant savings, but the benefits go far beyond that. When you sign up for our exclusive membership, you get special privileges and access to offers like . . .
To discover more, contact us today!